Freebie Friday Week 7 ! 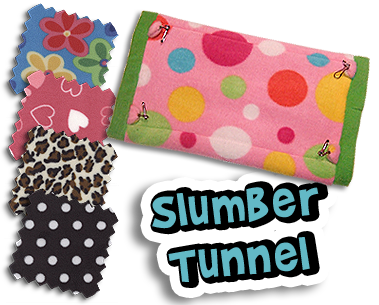 This weeks prize is a Snugglesome Slumber Tunnel, and this week you can choose your own design too! The Hammocky Slumber Tunnel is our most popular products and with good reason. You can sleep in it, on it, or even under it if the mood so takes you! Chins, Ratties, Piggies, Ferrrets, Degus … they all adore them, and the only problem you’ll have with one of these gorgeous Slumber Tunnels is working out how to actually convince your Pet to get out of it on Wash Day! All you need to do is leave a comment on this post telling us why your Pet would like to win a Slumber Tunnel. One comment per person please. We must be able to contact you via your comment. If you do not leave your contact details (don’t worry, they won’t be published) you will forfeit your prize and we will draw another winner. Comments will be closed on Tuesday 15th of November at 23:59 GMT and the Winner will be drawn (by Random.org) and announced shortly afterwards. My rescued ratties would love a slumber tunnel! They’ve never had a soft tunnel before, they love hiding away where they can’t be seen. We could all use cheering up as we have just lost someone special from the group. Last week I adopted 2 unwanted chins, who I have named Butch and Sundance. They would love to snuggle up in a slumber tunnle! My little piggies would love a slumber tunnel, somewhere new to investigate and and take a cozy nap. My little chin Leia has been with us about a month now but she is really shy still. She has a lovely house that keeps my dog Acey at bay as he is always trying to play with her. She loves her little log and she hides there all the time that’s why I know she would absolutely adore the slumber tunnel! I have 4 very lively boys all living in their own little, brand new, mansion: Bobby, Inca, Arbert and Ollie. They never stop and their cardboard tube is one of their favourites to whizz through and sleep in, a slumber tunnel would be a brilliant addition to their new mansion. My chinchilla’s love Hammocky Hammock products! My pigs and chins would have to fight over this gorgeous slumber tunnel…and I’m not sure who would enjoy it more! However, I am certain we would get lots of use out of it! hi my name is mealy and i have 1 little ferret called daisy she lives on her own because my parents wouldnt let me get 2 so i would like this tunnel so it can keep her busy. I have just found you’re products and i love them. I have 16 guinea pigs that are all very special to me, they love to snuggle so i am buying lots of different products at the moment to see which they like best. Then i will be ordering more. My piggies love snuggling in tunnels together, and i’m sure they could squeeze into this! I have two lively baby, teddy sow guinea pigs. And can a sure you this lovely made tunnel would not go to waste! This would help them bond more as friends, by snuggling up together in the winter. And pop-corning on the soft, cosy fleece on their little pink baby feet! You can leave another comment with your details (don’t worry they aren’t published), and we can edit appropriately or you can get in touch to confirm your email addy. I would love to win one for my piggies. I have five guinea pigs and they love to snuggle up. This would make them so happy. Although my piggie would love the slumber tunnel, I would love to win it so I can give it as a secret santa present to one of my piggie charities !! My ferret Weasel would love this tunnel. She only has 3 legs but manages to still move faster than me! She also may have a boyfriend moving in and she told me she’d love to impress him with one of these! Hello my name’s George (guinea pig) and I have been to Rabbit and Guinea pig Welfare in Rugby today. I’ve met the girl of my dreams and she’s come home with me! We’re both a little shy with each other and I would love a slumber tunnel to share with my new wife Poppy please. My chinchilla Abbey needs her own slumber tunnel because she doesn’t like to share the slumber tunnel with her sisters. I have recently taken an African Pygmy Hedgehog away from his previous neglectful home, he is very poorly and needs to be kept warm at all times, I would love to put this in his igloo for extra warmth. I have just stumbled accross your page through a website about degus and I love it because it’s so hard to find items such as these for pygmy hedgehogs! My 2 girly piggies love nothing more than to chase each other through and play peek-a-boo with their tunnels, so I am sure they would love another one added to their collection! I breed chins and don’t have a slumbertunnel to everyone of them. Therefore I think that they would love to have this one! If I win this it will probably go to one of my African violet girls. She comes from a farmer and would become a fur but I saved her from this. She is wonderful and love to cuddle but sits all alone because she is to small to breed on and I don’t have a baby girl to put her with. I therefore think she would love to have this slumbertunnel. Lila and Kiwi love nothing more that snuggling up in a slumber tunnel and need a new one, as the 2 they have are very chewed! Ooo thanks for the chance, we would love to win a tunnel as bob keeps making Neelix jealous in his which he loves, poor neelix hasnt got one in his cage yet! RSS Available | What is RSS? Freebie Friday Wk8 – Winner Announced! Freebie Friday Wk7 – Winner Announced!